The Glenmorangie Distillery tirelessly and relentlessly produces our delicate, complex spirit; each stage of the production process is precise and perfect in its own right. At its core is a small group of men with immense skill and enviable knowledge. The craftsmen of Glenmorangie, the patient patrons of quality and excellence, they are the backbone of the Distillery, they are the legendary Sixteen Men of Tain. These sixteen individuals are the living embodiment of our founder’s vision, the unofficial guardians of our malt, who still, to this day, use the time-honoured, traditional skills that have passed from generation to generation. 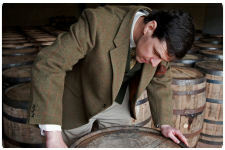 Together they ensure Glenmorangie is made in the same, unhurried and uncompromised way it always has been since 1843. At Glenmorangie we are particular. To safeguard the delicate complexity of our single malt, it is imperative that we use only the very best casks made from the finest wood. Our pioneering research into the effects of maturation spans more than a quarter of a century and we pride ourselves in being the leader of the Scotch whisky industry in this regard. 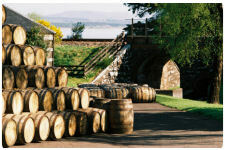 Glenmorangie uses primarily white American Oak casks that have previously contained bourbon. The majority of our casks are first fill (that is, they have never before matured Scotch whisky), and an important proportion are made from air-dried, slow growth wood, to our specification. Know as our ‘designer casks’, the use of air-dried, slow growth wood holds many benefits. Because slow grown timber contains more of the relatively open porous growth that occurs in the Spring, giving it greater maturation potential than faster grown wood. At the same time, air seasoning the wood reduces the astringency and bitterness derived from the tannins in the wood, and helps open up the internal structure increasing the ability to promote oxidisation. So, of the two ways to dry wood for cask manufacturing - kiln drying or air seasoning - kiln drying will enhance the quality of flavour in casks filled many times, while air seasoning allows the release of softer richer flavours. It is these qualities of air seasoning that we believe enhance Glenmorangie’s delicate, alluring character. For our extra matured products, we hand select port, sherry or wine casks from the leading vineyards and chateaux of Europe. These casks, chosen for their provenance and quality, complement the complex characteristics of Glenmorangie as they create expressions of exquisite taste and finesse. In ancient northern Scotland a small but highly skilled and sophisticated people, known as the Picts, ruled the land. Much legend surrounds the Picts, the ‘original’ people of Scotland, but the name means ‘the painted people’, and was probably a reference to the intricate designs they were said to tattoo on their bodies. Although we know very little of their past, the Picts have given us a tantalising insight into their culture and the icons of their society. They were said to be a civilisation that was proud, strong and confident, and have left behind beautiful, highly decorative metal and stonework pieces that were almost exclusively precious, high-status symbols of the time - just like Glenmorangie is today. Close to the Glenmorangie Distillery stands a majestic eighth century standing stone. Intricately carved by the Picts - an ancient civilisation that ruled northern Scotland - the Cadboll Stone suggests a civilisation that was proud, strong and confident, much like Glenmorangie. The bottom panel of the stone perfectly represents the kaleidoscopic nature of our spirit and we have adopted this as our brand emblem - the Glenmorangie Signet. The infinite swirls, complicated design and three dimensional engraving, known as triscles, perfectly representing the multi-layered complexity and texture that makes Glenmorangie such a delicate and alluring spirit. The original Cadboll Stone is housed in the National Museum of Scotland in Edinburgh, but an exact replica can be visited in its original place on the shores of the Cromarty Firth, adjacent to Glenmorangie House at Cadboll. The Cadboll Stone is a powerful icon for Glenmorangie, an emotive symbol of our Ross-shire roots, reflecting our pride in our heritage and our distinctive Highland culture. At the core of the Glenmorangie Distillery lies the Stillhouse; the living, beating heart of the distillery where simple raw ingredients are transformed into a spirit of rare finesse and subtlety. Measuring 16 feet and ten-and-a-quarter inches (5.14 m), the Glenmorangie stills are the tallest in Scotland, and are exact replicas of the second-hand gin stills our founder purchased in 1843. Beautiful and elegant, the eight majestic stills line the room, their height filling the cavernous space from floor to ceiling to create a spectacle of splendour and awe. Unlike smaller, traditional onion stills, the long, elegant swan necks of the Glenmorangie stills ensure only the lightest and purest vapours ascend to the top and condense into spirit. With all harsh flavours removed from the distillate before maturation, this gives our spirit its deliciously balanced, delicate nature and its undeniably alluring complexity. In the hills above the Glenmorangie Distillery, there is one of Glenmorangie’s most prized assets; a small natural spring bubbling with cool, crystal-clear water. Starting its journey as soft Scottish rain over 100 years ago, this pure water has slowly filtered through the landscape’s alternating layers of porous limestone and sandstone, gradually collecting the natural minerals that give it its ‘hard’ water quality. As the only Highland distillery to use hard water in its production, the Tarlogie Springs are at the heart of Glenmorangie, as this unique, mineral-rich water undoubtedly contributes to the deliciously fresh and delicate character of our spirit. So important are the Tarlogie Springs to Glenmorangie that in 1989, the Company thought to safeguard their purity, purchasing 650 acres of surrounding woodland to protect its future, and ensure that Glenmorangie would always retain its unique, distinctive character. In the heart of the Scottish Highlands lies Glenmorangie House, a secluded retreat where the welcome is warm, the atmosphere relaxed, and time is savoured almost as much as a glass of Glenmorangie itself. This is a Highland home on an intimate scale. Set in tranquil surroundings overlooking the unspoilt shores of the Cromarty Firth, this is the perfect haven from which to visit Glenmorangie’s timeless distillery or explore the lands of our native Ross-shire. 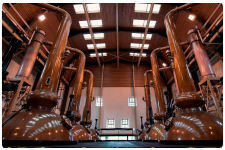 Fifty years after the first stills were installed at the Glenmorangie distillery in 1843, The Glenmorangie Company was officially established and registered (as Macdonald and Muir Ltd) by Roderick Macdonald and Alexander Muir in 1893 as a wine and spirits company. Today, the company is one of the most famous and well-respected Scotch whisky distillers and marketers of premium Scotch whisky brands worldwide. The Company is an intriguing mixture of the past and the future; producing its range of malt whiskies using traditional methods and, at the same time, through expert marketing and product innovation, delivering new experiences to today’s consumers. 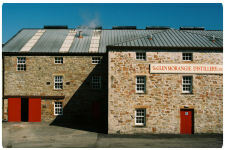 Headquartered in Edinburgh, the company produces three main single malt brands – Glenmorangie Single Highland malt whisky, Glen Moray Speyside single malt whisky and Ardbeg single Islay malt – in addition to a range of other whiskies. All of the whiskies are distinctive and have regional characteristics. 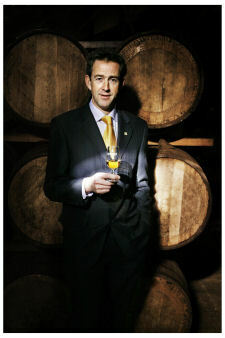 The Glenmorangie brand is a real success story in the world of malt whisky. It has the tallest stills in Scotland, which give the single malt its highly complex and distinctive flavour. Glenmorangie was also the first distiller to realise the importance of wood in the maturation process and in the 1990s, it pioneered ‘wood finishing’ to add diverse and intriguing characteristics to the much-loved Glenmorangie taste. For decades it has been the favourite single malt in Scotland, the home of Scotch whisky. Despite distributing to over 120 markets world-wide, the distillery still remains one of the smallest in the Highlands and employs just sixteen craftsmen - "The Sixteen Men of Tain" - who have become synonymous with the Glenmorangie brand all over the world. In 2004, The Glenmorangie Company acquired The Scotch Malt Whisky Society, allowing improved access to the whisky enthusiast and the potential to accelerate the development of this business. The acquisition is compatible with Glenmorangie’s vision of being a leading player in the Scotch malt whisky sector. In 2005, The Glenmorangie Company was acquired by LVMH - Moët Hennessy Louis Vuitton – the world’s leading luxury brands group. Glenmorangie Original is an inviting single malt whisky, acclaimed and appreciated by luxury spirit drinkers around the world. The original expression of Glenmorangie’s elegant, floral spirit that is renowned the world over for exquisite finesse and alluring complexity, The Original is the intriguing marriage of delicate spirit and long, slow maturation. The taste characteristics from the first-fill bourbon casks that permeates the majority of the aged spirit, coupled with the increased proportion of our ‘designer casks’ (made from slow-growth, air-dried American oak from the Ozark Mountains of Missouri), results in a delicious spirit that enhances the relaxed and convivial mood of the group by igniting the senses. The Original is, quite simply, the most delicate and deliciously complex single malt whisky in the world. Glenmorangie Lasanta is an elegant and full-bodied single malt whisky that has been extra matured in Spanish Oloroso Sherry casks after a minimum of 10 years in ex-bourbon casks. Its luscious, soft mouth filling texture, and its deep, enticing, sweet aroma appeals to luxury spirit drinkers who like to experiment, and whose confident choices, warmth and passion inspire the mood of the group. Non chill-filtered and with an ABV of 46%, its key flavour notes are of toffee, raisins and walnuts. Glenmorangie Quinta Ruban is a velvety-textured single malt whisky, for confident, colourful, dynamic luxury spirit drinkers who like to take the lead. A mature Glenmorangie that is transferred from the original ex-bourbon cask and then extra matured or ‘finished’ in port pipes, shipped from the ‘Quintas’ or wine estates of Portugal. Maturation in the ruby port pipes develops The Quinta Ruban into a voluptuously smooth spirit with a complex balance of sweet and dry flavours that engage the entire palate and envelope it in an intriguing balance of smooth velvet and crisp, cooling textures. The beautiful ruby colour is derived from the ruby port pipes that are used for maturation, and the intensity of this hue is untouched by the non chill-filtering process. With an ABV of 46%, its key flavour notes are rich, chocolaty and minty. A captivating single malt whisky for the sophisticated luxury spirits drinker who enjoys delicious extravagance and sensual pleasures. With a tremendous ‘gourmand’ appeal, The Nectar D’Òr is Glenmorangie’s delicious, complex base spirit that, after a minimum of 10 years in ex-bourbon casks, is then extra matured in specially hand selected Sauternes wine barriques. This makes it rich and sumptuous with a heady, luscious, beguiling spectrum of aromatic patisserie desserts that helps create a memorable occasion whenever it is enjoyed. Non chill-filtered and with an ABV of 46%, its key flavour notes are lemony, sumptuous and syrupy. Taste: The smooth, melting creaminess of lemon tart leaves the mouth full of citrus tang that gives way to crème caramel and zesty lime. 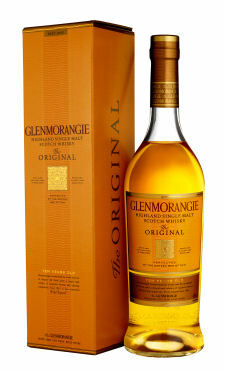 Glenmorangie 18 Years Old is a specially aged, rare, malt scotch whisky of distinction. With a rich bouquet and full, rounded flavour, it appeals to the luxury spirits drinker who appreciates serious quality. Slowly matured for 15 years in the finest ex-bourbon oak casks, a proportion is transferred to Spanish Oloroso sherry casks for the final three years of maturation. It has a silky, smooth texture, a long, enticing finish and an intriguing balance of sweet dried fruit and a dry Oloroso nuttiness. With an ABV of 43%, its key flavour notes are mellow, nutty and dried fruit. Glenmorangie Quarter Century is an extremely rare and delectable single malt of notable age and intense, full-bodied flavour. A voluptuous, mouth-watering single malt whisky for the luxury spirits drinker who always knows what the moment calls for, and does not hesitate to enhance the moment by sharing with those around them. Bursting with depth of flavour, dried fruits, blackberries, plums and dates are married with chocolate, coffee and cinnamon spice as this mouth-watering, full-flavoured, rich and complex expression engages and entices the senses. With an ABV of 43%, its key flavour notes are fruity, intense and spicy.